Know what’s cooler than straddling a state line? Zip lining across one. Do you know the only place in the country where you can zip line across a state line? Here – in Columbus, Georgia. Yep, we have a 1,200 foot zip line, called the Blue Heron, that will take you speeding (okay, you’re only going about 40 mph, so it’s not really speeding) across the Chattahoochee River from Columbus, Georgia to Phenix City, Alabama. As soon as you arrive on location, you’ll realize why it’s called the “Blue Heron.” Because you can’t possibly miss the Heron’s nest the size of a queen size bed atop a winding staircase that will lead you to the drop off portion of the zip line. But don’t let me scare you… There are men, women and children of all ages gearing up to zip across the river. By gearing up, I mean literally stepping into ropes with carabiners and all sorts of gadgets that are there for your safety, while someone on staff ensures everything is fit properly for your adventure. Once you’ve made it up to the heron’s nest, feeling 20 pounds heavier from all the gear, the staff at the top will take your picture, hook you up to the zip line and tell you to step right off. One step is all it takes and you’re soaring like the birds a hundred feet over the river with the Columbus skyline in full view. And if you’re anything like me, this adrenaline-pumping action will make you scream at the top of your lungs the entire way across. Lucky for us, the staff couldn’t be more prepared and professional throughout the entire experience, creating a relatively graceful landing into the treehouse-esque tower sitting on the bank of Alabama’s side of the river. (SPOILER ALERT) From there, you will get hooked up to another zip line, which was a huge surprise to me as I thought the “ride” was over at this point. This shorter zip line goes along the bank and through the trees until you reach another tower with staff waiting to assist with your landing. And guess what?! 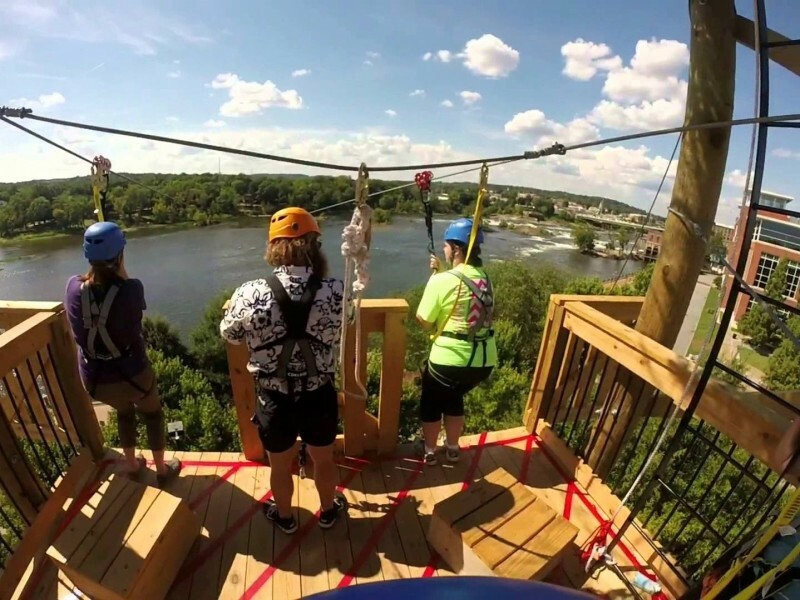 Then, enjoy yet another zip line that will take you back across the river to Columbus! So cool! On my first zip experience, I was fortunate enough to get in on the last zip line of the day at approx. 5pm when the sun was making its way down. As soon as I landed back in Georgia, I walked straight over to a 7pm reservation at 11th and Bay, a fabulous restaurant that sits along the river at the edge of Uptown Columbus. I’d highly recommend this place or any one of the many local spots within walking distance in Uptown that will serve delicious cocktails as you start to relax after your zip line. Cheers to adventure! Click for details and to book your trip today!